The competition is growing in the business world and each organization wants to hire the best candidate by using different interview tricks so that they can know if the person they are about to hire is good enough or not. During the interview sessions and the whole process of interviewing, the interviewer tries to bring out the actual personality of the candidate. It is important for an interviewer to understand the personality of the interviewee because it helps them to understand their candidate’s ability to handle the job required to be completed. Therefore, personality interview questions to ask are presented in front of the candidates so that they can improve their personality in order to provide better performance at work. How to Answer Personality Interview Questions? There is no specific rule related to personality job interview questions, but still, the recruiter wants to try their best in finding out the actual personality of the candidate. Interview question about personality can really do the trick and give you the result you wanted out of the interview, but the thing which is important is, you ask the right question. A right question leads to the right answer and ultimately you will have a fruitful interview. Generally, most candidates have nervousness to deal and that’s why they try and hide their real personality in the interview and pretend to be someone you want for the job. Asking personality questions for interviews that reveal their personality can do the trick and you got to know the real person and whether the candidate is a good choice or not. The introduction is a common scenario in the interview and most interviewers start the interview by asking for an introduction. The introduction can go in any direction as it mostly depends on the interviewee, but a smart interviewer knows what to look for. It is a common question that is obviously asked in all interview processes but sometimes answer matters the most. This introduction process brings out the level of confidence of the candidate. Sometimes it might even happen that most of the candidates prepare themselves for this introductory part of the interview and try to impress the interviewer with their pre-rehearsed answers to the interview questions. But a well-trained interviewer with experience sees right through the words and have a very sharp eye focus on the interviewee words. Therefore, the introduction question can consider as the part of the personality related question, but with a condition that the interviewer knows how to read through the words and have the experience to go with it. Strengths and weaknesses are something one cannot lie about, but there are candidates out there who prepare for such questions, but generally, not many of them have the smartness to lie about the strength and weakness with such smoothness that they easily go off the hook about the question. Asking interview questions on personality related to one’s strengths and weakness can definitely bring out a certain level of the honest personality in the candidate who is attending the interview, as everyone has some weaknesses and strengths. During the interview sessions, most of the candidates are fully prepared with all sorts of expected and unexpected questions, and even the interviewer should also be prepared for all sorts’ of answers from their candidates because each person is different from others and what one can think, others cannot know that. Therefore, strengths and weakness related personality interview questions deliver a straight answer or an answer that can hit close to home. 3. Any movie, which you like and that inspired you to do something? People have different opinions about the movies and some of the movies have capabilities to inspire the people, but the fact is different movie inspires different people in the entirely different manner. You cannot say a movie has the same effect on more than one person; each of us has our own opinion and way of thinking. Sometimes during the interview, candidates get approached from their interviewer regarding any movie they have watched lately. When an interviewer asks about any movie that the candidate watched which he thinks made an impression on him in anyways can help them understand him better. Actually, interviewee’s opinion of the movie shows their way of thinking and their perspective about the things which interviewer cannot ask directly. Therefore, when these movie sorts of questions are being asked, then the candidate needs to think of the movie, which helped him change his viewpoints about a certain subject or anything spontaneous and the answer shows their true personality. 4. Do you read books and what type of books? Reading is one of those habits that have a positive effect on people and most people think of it as a good habit. Reading books or having the habit of simply reading can differ from person to person; hence the effect of reading is different on each individual. When an interviewer inquires about the reading habit or reading a book recently, he is exactly trying to know your way of thinking about reading and what you read which help in defining the personality of the interviewee. This question is somewhat related to the previous question which is about the movie. With the help of this question, the interviewer tries to understand likes and dislike of the candidates which directly explains their personality type. Therefore, it is necessary to understand the question first before answering them. People who read books don’t require being quiet and boring. It can even be someone’s habit which helps them sleep or concentrate more. Reading a book has all sorts of different effects on the people. 5. Tell us about such creative ideas which made a mark of your talent in your previous working company? These types of question are asked to trick the interviewee in talking about the previous workplace and how they were in their last job. 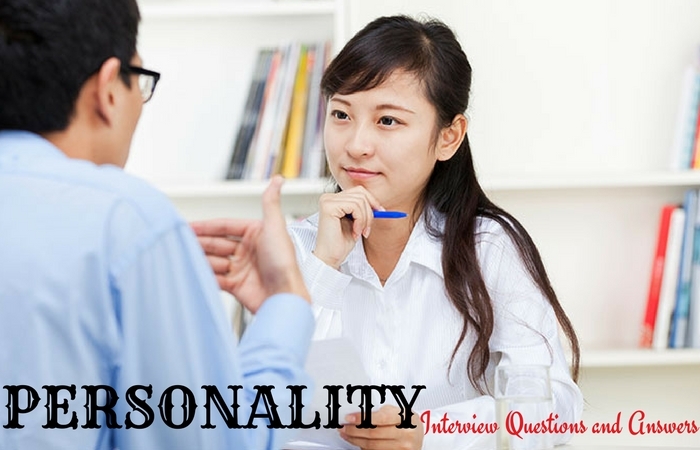 With the help of this type of personality-oriented interview question, an interviewer tries to understand the potential of the candidate in their field of work. Presenting a question which involves work experience and their ability to approach a creative idea give an opportunity to the interviewer to know more about the interviewee approach towards work and how they contribute for projects in future. Therefore, while answering this question the candidates need to present their previous work life incident which helped them made an impression in their field of work. This type of question is important to ask in an interview because of this show if the candidate is fit for the job you are offering or not. 6. How do you handle unexpected issues in the workplace? There are lots of unexpected issues happen in one’s life and people use a different approach to tackling these work issues, but what matters the most is the approach they use to tackle such issues. Different approaches are used to tackle unexpected issues give the sneak peek into their personality and give the chance to understand a little more of a person and how they actually are. When an interviewer presents such a question where the candidates are required to share some of their actual work life situations, they intended to know the interviewee little more and understand how they actually deal with the situation. Candidates need to answer them with complete honesty and proof of their work so that they can show how worthy they are for the job. In this question, the interviewer is expected from the candidate that he should take a positive approach towards any type of situation which comes in front of the employees unexpectedly. 7. How good are your communication skills? People communicate all the time and it plays such an important role in human life that one cannot imagine a life without some sort of communication, but when it comes to the job and workplace communication can really make it or break it. Good communication skills can be learned or they come naturally, but none the less they are important. Communication is a common element that creates a connection between two people. And being proficient in communication is the main skill that each and every employer expects from their candidates. Therefore, if a candidate is not that sure about their proficiency in communications, then they should always be honest with their interviewing panel to avoid confusions in near future. Moreover, it is necessary that the candidate applying for the post needs to be confident about their communication. When an interviewer asks how good are your communication skills, they actually want to know your soft skills and handling professional communication. This is one of the common interview questions in most interviews, but the main purpose of the question is to understand how candidates see themselves and what their approach for the future plans is. Many candidates give some animated answer which shows how far they are from reality and have no idea about the job and progress and no concrete plan for growth. These questions, like where do you see yourself 5 years from now is a mere expression of understanding the candidate and their work goal. This question helps in understanding the ability and work goal of the candidate. Most of the time, candidates with the high level of ambition make difference in such type of interview sessions. Therefore, it is necessary to handle such a situation with a better positive approach and give an answer close to real situations and goals. 9. Are you a team player? This question is pointed to check on how good you are with team working skills. Working in a team is part of the most jobs and most interviewees expected to be working in a team after they got the job, but having a nice relationship with colleagues is also important. If an employee cannot perform well within the team or with the team, then it is a bad news for the employer. It is necessary to understand that the process of interview is a measurement of one’s potential regarding handling the job, but sometimes some of the candidates do not go that well with the team working style. Therefore, it is necessary to understand that the interviewer expects some of the level of the group working environment better than being a leader alone. Moreover, working with the team helps to learn more than being a self-motivator. 10. How do you deal with personal difficulties? These personal difficulties related questions are being asked because, if the candidate is going through some personal difficulties or have some personal baggage then they may affect their working or want to work overtime. The employer would like to know how well the candidate is handling his or her personal difficulty and if their personal problems going to interfere in the professional life. Therefore, it is not necessary that the candidates need to share their personal information with their interviewer, but if the candidate is comfortable sharing their personal difficulty then it’s all good to go. No one can judge the candidate on the basis of a personal life so there is nothing to be worried about. 11. Are you looking for long-term job? This can be a tricky job interview personality questions because if the candidate is a fresher and would like to learn more in their field of work, then the candidate needs to be honest with their interviewers. But if the candidate is looking a long-term opportunity in the company, then they should come up confident and strong with their answers. Therefore, while answering any type of these questions about personality the candidates need to remember only one thing and that is to present their personality strong. As per a few experts, a personality interview goes well for both the interviewer and the interviewee. This kind of interviews helps the interviewer to understand the candidate very well. Technical and subjective knowledge is not the only thing which employers look for when hiring a candidate, the personality of the candidate is also given prime importance. Here we are providing some top personality interview questions which candidates face in an interview process. How good are you while conversing? How do you deal with pressure and stress at work? What is the one thing that motivates you? How would you deal a situation when your boss decision is contradicting yours. Do you read books? Which was your last read book? Do you think you are a perfectionist? Where do you want to see yourself 5 years from now? Which one describes you better, a morning person or a night owl? Tell us one thing that you wish to change about how you deal challenges? If you could be animal, which one would like to become and why? Finally, the bottom line is that at the end of this discussion about personality interview questions and answers, most of the readers who would like to know more about such personality-related questions and understand a way of handling such questions, they can read all the above-mentioned questions and their answers to feel good about themselves during their interview sessions.